If you are a curious guy installing different applications, trying them and removing the one not needed, you must have faced broken packages issue at some point of time. This could be because of various reasons and can to some extent hamper your system's performance. Broken packages can make a mess of your system. 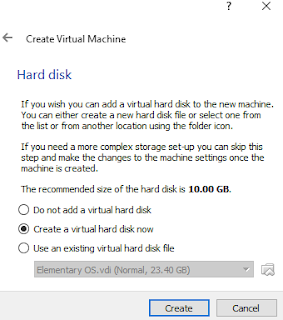 There could be some dependency missing, or while uninstalling, some part of the application is not removed completely and not allowing a reinstall. However, you can easily fix it with a couple of commands. In this article, we will see how to fix broken packages in Ubuntu. If you know the package name, you can completely remove it with the below command. Along with the packages, the dependencies are also installed. However, you remove the application, the dependencies are left as it is. Using the below command, you can remove these unwanted dependencies. autoclean deletes the local repository of the retrieved files that can no longer be downloaded and are mostly useless. The below command removes any packages that are not updated and no longer needed along with the configuration files it needs. Chances are that one of the above command will fix broken packages in Ubuntu. Once done, do not forget to update your system. 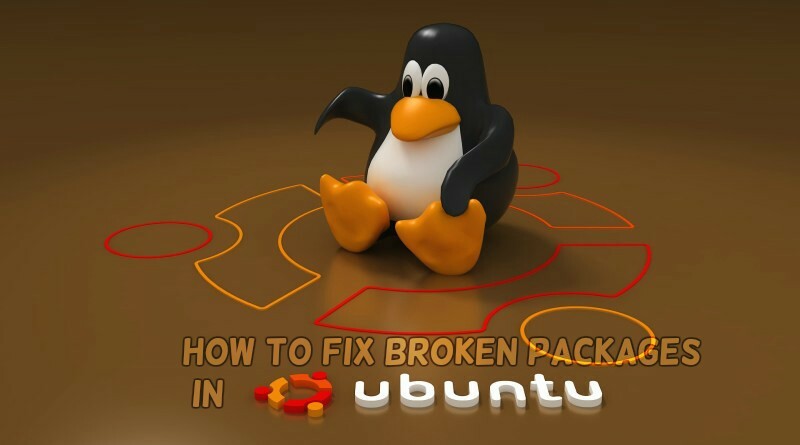 Do you have any other suggestions to fix broken packages in Ubuntu? Let us know in the comments. digiKam is a free and open source photo management application providing a set of tools for importing, managing and editing digital photos and RAW files. digiKam's import feature allows to transfer photos, raw files and video directly from the camera and memory cards. It includes tagging tool to assign tags, ratings and labels to your photos and the filtering option can be used later to see only particular photos. 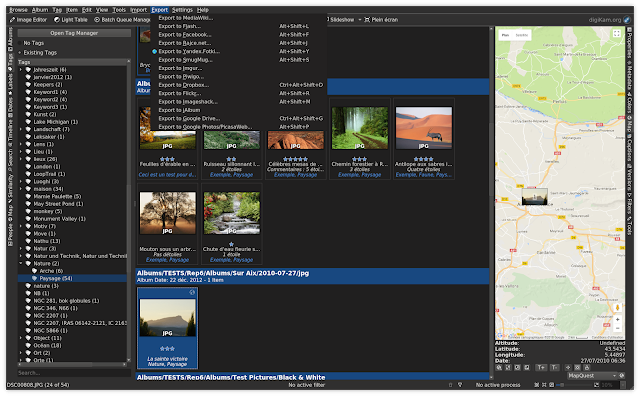 There is a powerful search and filtering functionality, and digiKam also includes basic tools to adjust colors, cropping. curves adjustments and more. Import photos, raw files and videos with lossless conversion and camera information display. You can auto-rename and auto rotate images and create defaults albums while importing. Organize your library by grouping them with tags and ratings into albums and sub-albums. Sorting options includes folders, name, date, file size, rating, file types, tags and labels. Support for RAW pictures using LibRaw. Displays other useful information like metadata, image information, geolocation, file properties, similar file comparisons etc. You can read the complete feature list here. An AppImage is available for digiKam which can be downloaded from the below link. These terminal commands installs digiKam available through the distribution and might not be the latest release. Hence, using the AppImage is the best way to get the updated digiKam. Do you use digiKam to manage your pics? How's the experience, tell us in the comments. Manjaro Linux is cooler than ever! Did I just notice something similar to 'blue screen of death' in my Linux system? Nope, its the Manjaro Linux homepage! In an attempt to 'celebrate' the April Fool's day, Manjaro Linux has made its homepage cooler than ever! It's like living the old days of computing and I was more than surprised. Take a look by yourself. If you don't trust me, visit the official website. Looks like the theme is highly inspired by https://linuxbbq.org/. Apart from the official website, when you head over to News section, you will find that Manjaro Linux is officially reintroducing the 32-bit support as more people are moving to old Atom netbooks in search of systems not vulnerable to Spectre-type attack. In a rather sarcastic way (allow me to call it, please), they thanks the ArchLinux32 community for investing huge amount of time and effort in keeping the old systems alive, since they know the only secure systems are 32-bit system. And to add to it, the Download page only contains the link of 32-bit Manjaro Linux with XFCE desktop. We are eager to hear you, let us talk in the comments how awesome it is! Note : You must read this. We all love Linux Terminal! Though Linux has evolved over time and provide a better and much competitive Graphical User Interface, Terminal still remains the best part of it. Some of us prefer the App Center and rest add PPAs to install something. Some even go the extent of using Lynx browser in Terminal. 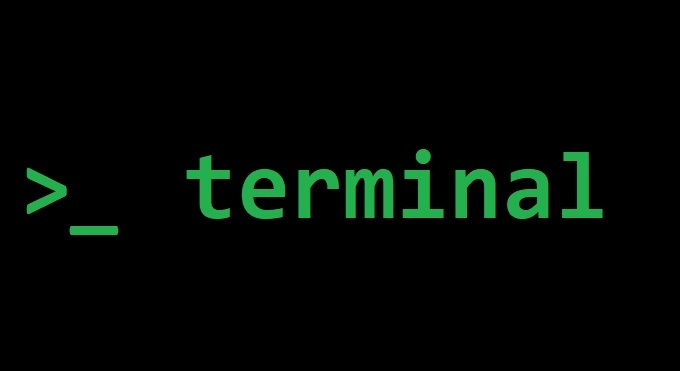 Not only the Terminal is useful, it is the most powerful part of a Linux system. I'm mostly a terminal guy, and there is always a black window running. Being an Ubuntu user, the one thing I don't like about it, is the default background color which matches the Ubuntu theme. I prefer it mostly black background color with the text either in white or green. If you are just bored of the default look of your Terminal, keep reading. In this article, we are showing some of the ways by which you can customize Linux Terminal easily. The easiest way is to customize the default Terminal according to your preference. Open Terminal and click on Edit > Profile Preferences. You can see the various options to customize your Terminal. Under the General Tab, you can set the initialization parameters, cursor shape, and text appearances options. 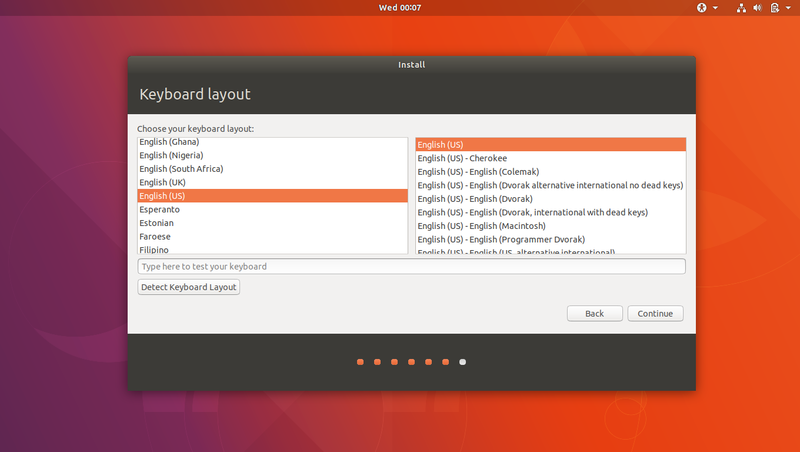 Under Color tab, there's option to choose the built-in schemes and default terminal. As I told you, I personally like a black screen with a dark green text colors, and this is what is looks like. Neofetch is an awesome command line interface tool written in bash that displays system information, OS logo and is highly customizable. So, feel free to change colors in the terminal, adjust transparency and let us know if have any other way to customize your Linux terminal in the comments. A display manager often referred as login manager is a graphical user interface you see when the boot process completes. It is responsible for loading the login window and then the desktop environment once you enter the credentials. In a X Windows System, a display manager presents the graphical login manager which starts a X server session once the username / password are entered. 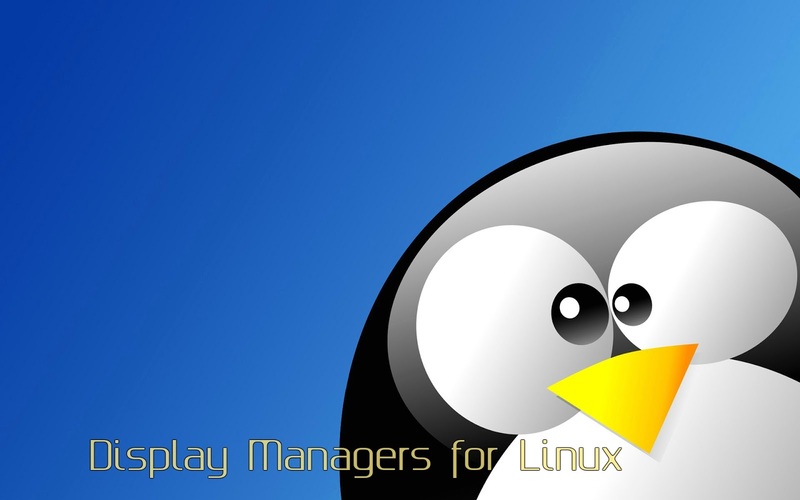 Being a Linux user, you never run out of alternatives; same is the case with Display Manager. There are many display managers which you can install and switch between, just to give yourself a new login screen. Question is, why would you like to switch your default display manager, and the answer is simple. You need a new login interface. You have to choose a display manager by yourself to set up for some distributions like Arch Linux. 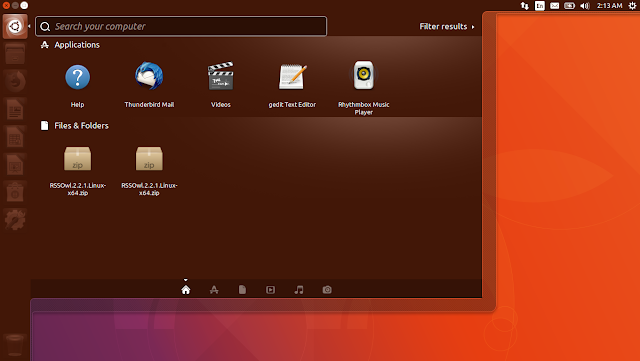 Your primary OS replaced the default display manager and you want the earlier one back - Ubuntu has switched to GDM3 from lightdm from Ubuntu 18.04. You want a lightweight display manager. You love to be a minimalist, and want a console based display manager. In this article, we will see some of the popular display managers and the steps to install and switch between them. GNOME Display Manager 3 (GDM3) is the default diplsay manager for GNOME desktops and a successor to gdm. In consistent to the look and feel o GTK/GNOME themed application. 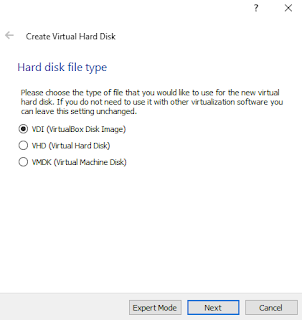 Options to select various desktop environments and windows managers. Regional settings and keyboard layouts can be set on per-login basis. You can perform some basic customizations to GDM3 like changing the logo icon, display background and GTK theme. Modify / Uncomment the desired settings, save and exit. Reboot and you will see the changes. XDM is the default display manager for X Windows System. It's perhaps the oldest display manager introduced in 1988 and is very minimalist, both in feature and interface. It can manager X servers running on local machine or a remote X servers using XDMCP. It is highly configurable and most of the behaviour can be controlled by resource files and shell scripts. It provides a simple and straight forward graphical login prompt. 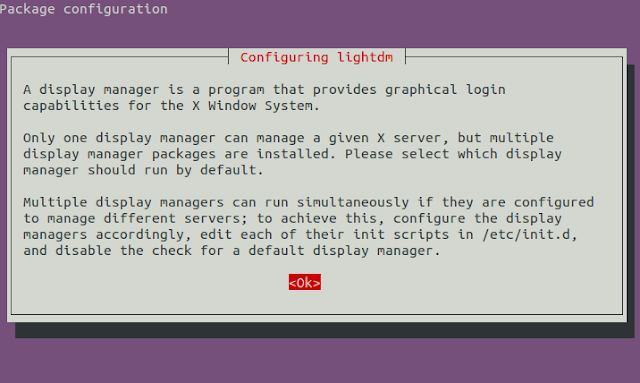 LightDM is a display manager from Canonical which was the default for Unity desktop environments. Being a lightweight, it is configurable and various themes are available. Simpler code base than GDM3, doesn't load GNOME libraries to work. Standards compliance (PAM, logind etc). SDDM became the default display manager from KDE5 replacing kdm and comes by default with systems that run KDE like Kubuntu. It is fast, simple and beautiful, with smooth, animated user interfaces. Designers have premade components like textbox, combox for theme creation. I hope you already have installed a different display manager than the default one your system comes with. Lets see how you can replace it. You can repeat this process to switch between different display managers. Changes will take effect only after a reboot. Troubleshooting : In case something goes wrong in trying any of the above display manager in Linux, use CTRL + ALT + F1 to switch to console mode and then run the above command with the display manager that was working fine earlier! Since Canonical has dropped Unity with Ubuntu 18.04 Bionic Beaver and switched to GNOME as default desktop environment, there is a mix response from its users. Some believe this is for better since Unity is always resource hungry. 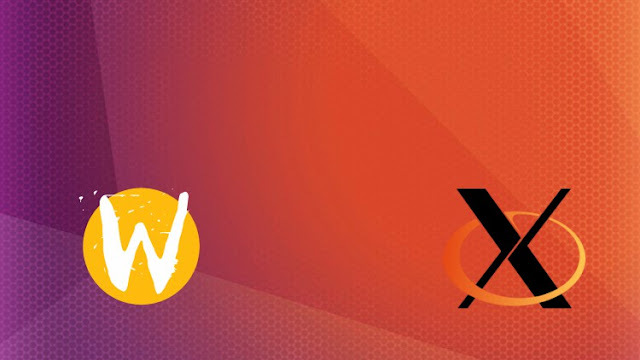 However, others feel it was Unity which had made Ubuntu stand different to other Linux distributions. I am in the later category. 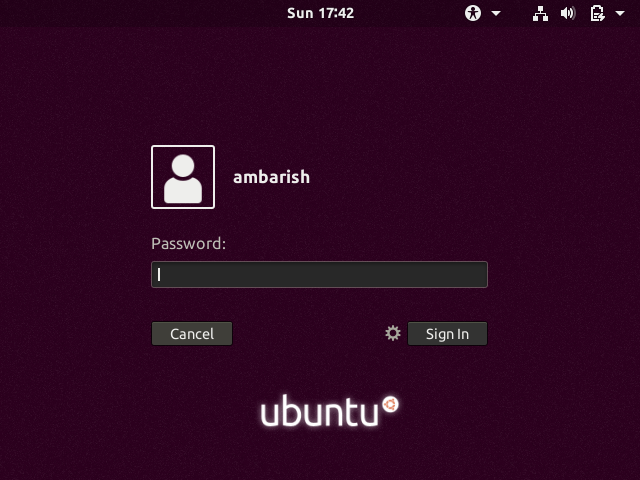 The reason I use Ubuntu as primary OS is because of the ease of use of Unity. The dash search has propagated in my life and GNOME environment looks alien to me. I had installed Ubuntu 18.04 in VirtualBox to try the GNOME desktop and wanted to switch back to Unity after a day! After all, if I want GNOME, I can always install it with a simple terminal command; why to make it default when Unity is your exclusive desktop environment. There is a good news though. Unity's development will continue and you can easily install Unity in Ubuntu 18.04. In this article, we will see how to install Unity in Ubuntu 18.04. During installation, choose lightdm as your default display manager. Reboot to login to Unity. This will install Unity in your system. 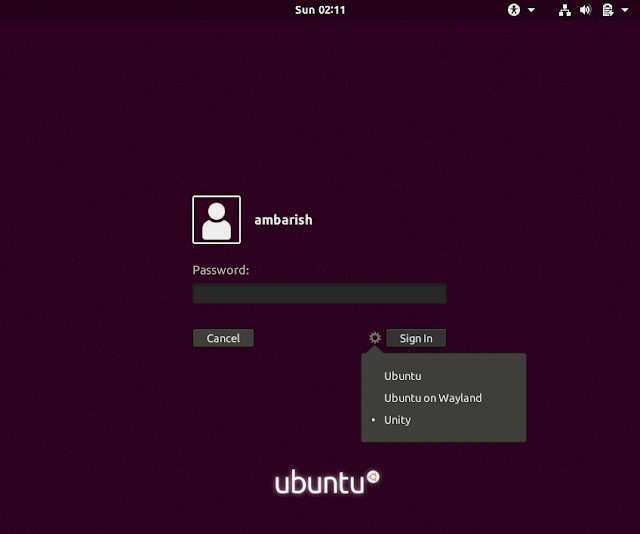 Now, to switch to Unity Desktop Environment, reboot your system and on the login screen, click on the button to display the available desktop environments. Choose Unity and you will login to it. Let me know in the comments if you face any issue while installing Unity in Ubuntu 18.04. Elementary OS has its own AppCenter with some high quality and open source applications. There are many free and open source software; some as complex as GIMP and LibreOffice (complex as in development, not in use). However, there are people behind the development of these software who devotes their time and hard work to make these work. Well known and widely used applications are still able to get some money in the form of donations but for a small team (or a single developer), it's really a tough thing. 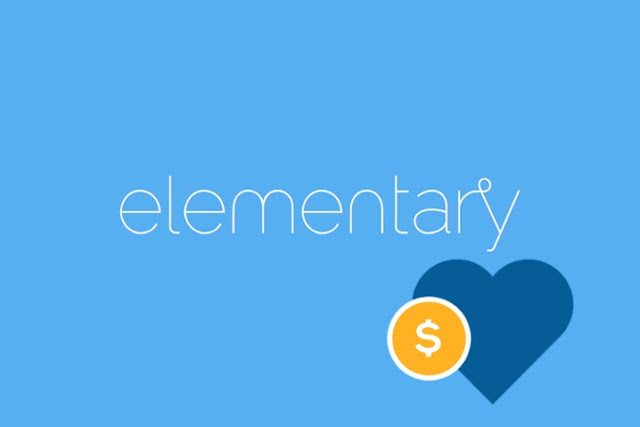 The founders at Elementary OS believe this may prove a hindrance in the expansion of their AppCenter and has decided to start a conveyance charge for the apps which you use through their AppCenter. This will apply from Elementary OS Juno release. For each time you navigate to the AppCenter to "Update All" your apps in one go, it will list out the paid apps and asks for the amount of money you want to donate before you can update them. This will only apply while updating, and not when you download an app for the first time which means if you liked an app and continuing to use it, you are prompted for a small donation of your choice for the next update. If you don't want to pay, you can simply fill it up with 0$ and move on with the update. However a small donation may help Elementary OS to have a sustainable AppCenter. There won't be annoying notifications and the free apps will still be available without any restrictions. This could be a great idea to attract developers to the community and generate at least a sustainable amount to keep on going with it. Moreover you always have an option of not to pay. This could bring in the necessary funding the developers need to sustain! On the other hand, it may frustrate some of the users who has a long list of installed software. Entering 0$ (or any other amount) for each application before it can be updated can be a pain. What about the system updates? As a Elementary OS user, you will still get all the critical updates and bug fixes free of costs without any ask of donation. This conveyance charge applies only for the "Update All" from AppCenter. You can still use a Terminal to updated them skipping the donation part. There are users on both side of free beer and free speech. Most of the free and open source software are relying on the donations they receive from their users. 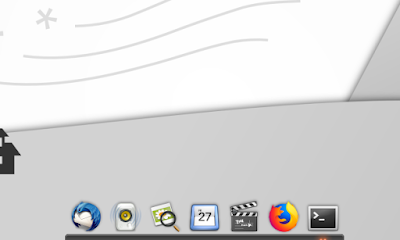 AppCenter of Elementary OS gives an option to developers to monetize their apps and get some money in return. This additional step can bring them some more of it, without limiting those users who don't want to pay. What's your opinion on this, we would like to hear in the comments. 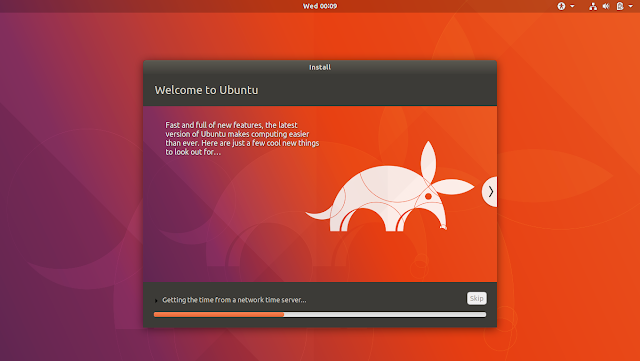 Canonical is all set to launch Ubuntu 18.04 LTS (Long Term Support) in April this year and the Ubuntu fans like me can't wait anymore. I went ahead and tried a daily build in virtual box and it seems quite stable already. 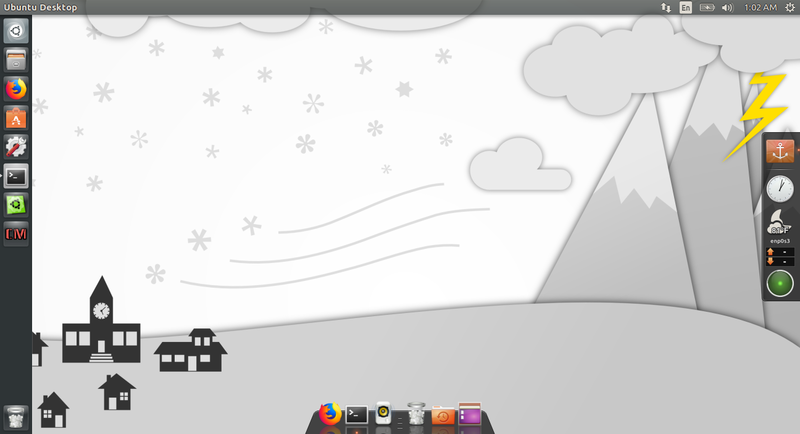 The GNOME desktop environment did not disappoint me, and the installation steps are same as any other Ubuntu release. There's a new Ubuntu theme and Canonical is finally moving to Xorg as default display server in Ubuntu 18.04. 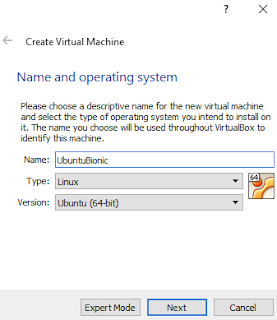 If you are new to Ubuntu and want to install Ubuntu 18.04 in a virtual box, you can find below a step-by-step tutorial. Remember that its a daily build and is still in alpha-release phase; expect some bugs and glitches. If you have not installed VirtualBox, download a copy from here and install it. Once done, launch it and click on New. 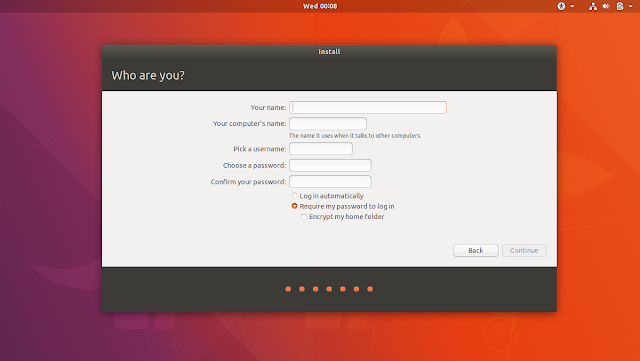 A dialogue box appears asking for the Name and Type of Operating System. Enter a name, select Type as Linux and Version as Ubuntu (64-bit). 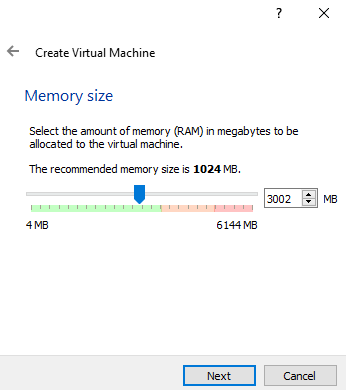 The next screen asks for the RAM you want to assign to the Virtual Machine. The recommended size is 1024mb but I would suggest using at least 2 GB of RAM for a better experience. Next step asks for the storage you want to allocate to Ubuntu 18.04. Make sure to allocate sufficient space for the updates and applications to not run out of storage at a later part. Click on Create to navigate to next screen. It asks for the hard disk file type. 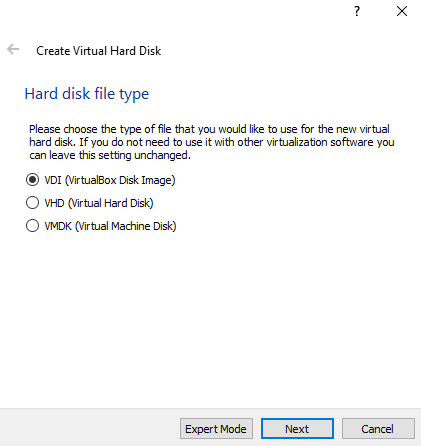 You can leave it to the default choice - VirtualBox Disk Image which will create a image file with the size you specified in the previous step. In the next screen, you can select if you want your physical device to be dynamically allocated or a fixed size. 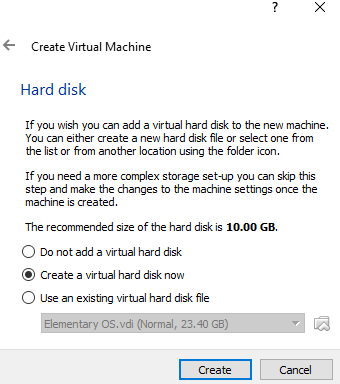 A dynamically allocated hard disk only takes up the space your Ubuntu OS is taking, from your primary storage. 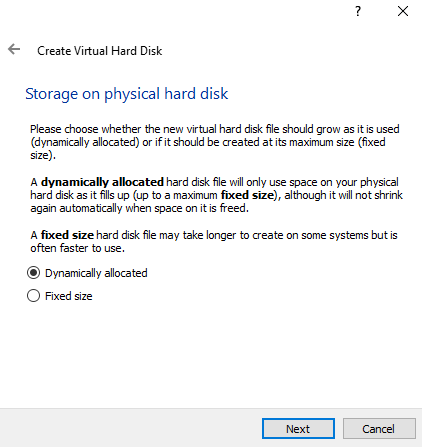 A fixed size means you assign that particular memory size to the guest OS and can not use outside to it. 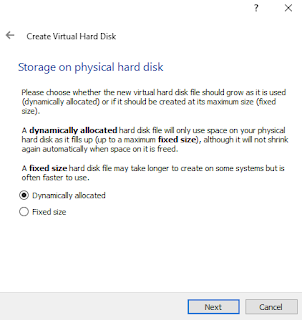 However a fixed size disk type is faster to use. 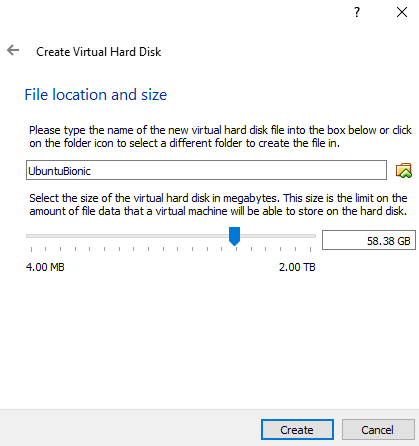 Next step will ask the amount of storage you want to assign to Ubuntu 18.04 LTS. Once done, click on Create to finish up the set up. 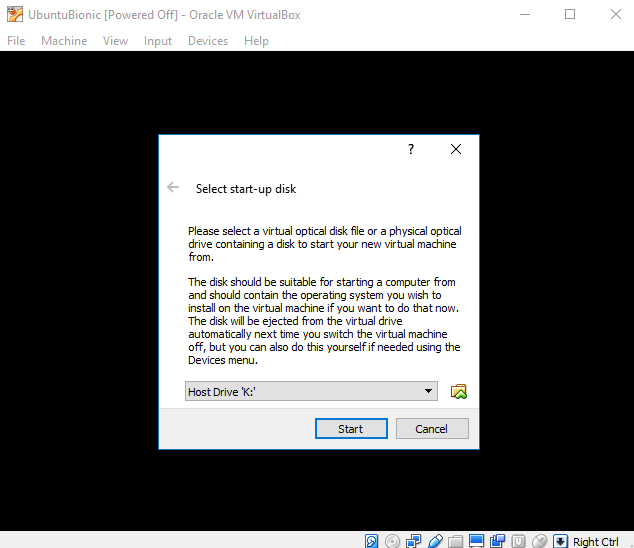 Once the Virtual Machine set up is done, Start it. 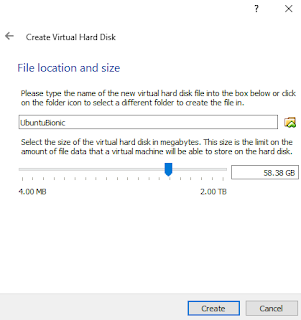 It will ask you to select the start-up disk. Click on the folder icon and select the ISO file you have downloaded from the Ubuntu's website. It will take some time to boot from the ISO. Once it boots, it will ask either to Try Ubuntu or Install it. 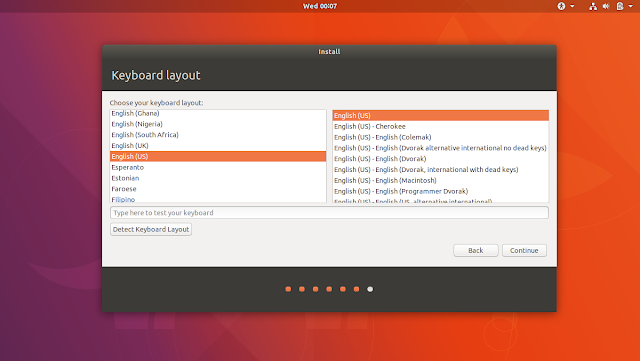 Select your preferred language from the left sidebar and click on Install Ubuntu. Next step asks whether you want to download update and install third party software for graphics and other media codecs. 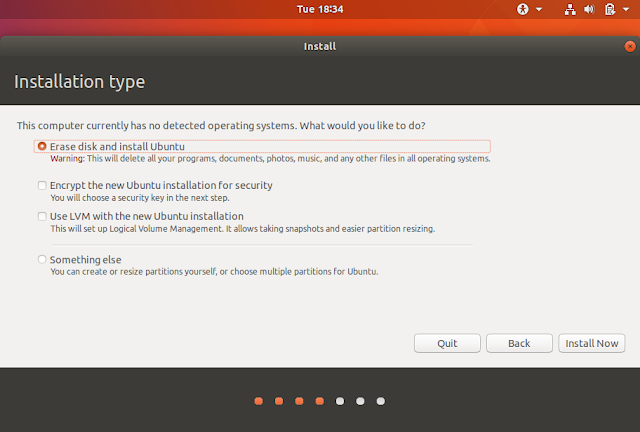 I would suggest to check both the options to get the latest of Ubuntu 18.04 and to save yourself from the pain of downloading and installing each drivers and codecs by yourself. Next option is the Installation type. Since you are using a virtual disk for installing Ubuntu 18.04 LTS in a virtual box there won't be any another operating system detected. 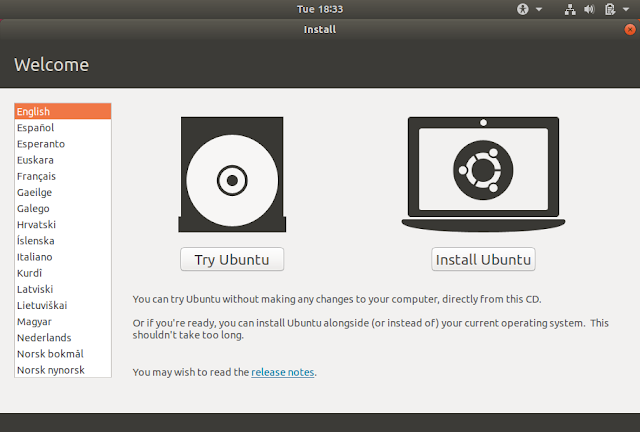 Erase disk and install Ubuntu will be selected by default. You can select to encrypt your new Ubuntu installation drive and/or use a logical volume management. 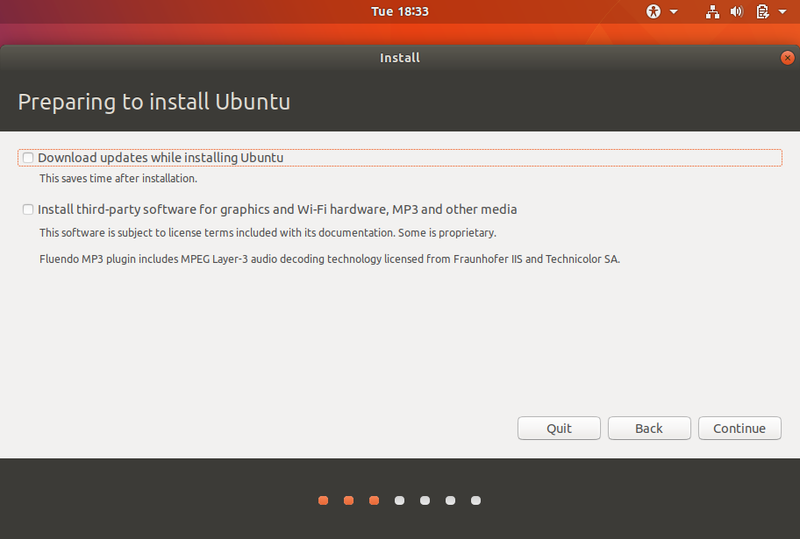 Once you select the options and click on Install Now it, the installer will display a warning. You can ignore it and click Continue. The next screen asks your geographical location. And the keyboard layout which you want to use. Before you start with the installation, you will have to create a user and password protect it. Fill all the details and click on Continue. Ubuntu 18.04 installation will begin. It will take some time depending upon the updates and your broadband speed. Wait for it finish. 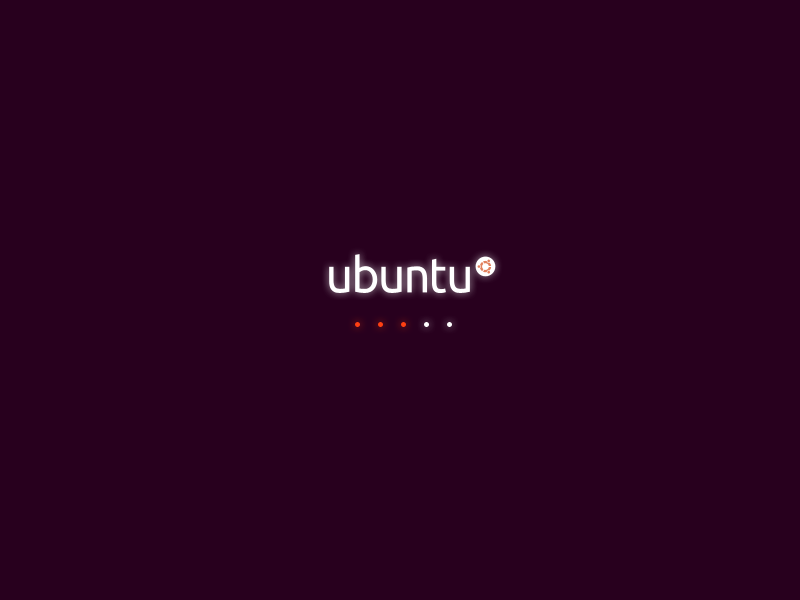 Once the installation for Ubuntu 18.04 completes, restart your system and you will see Ubuntu booting. 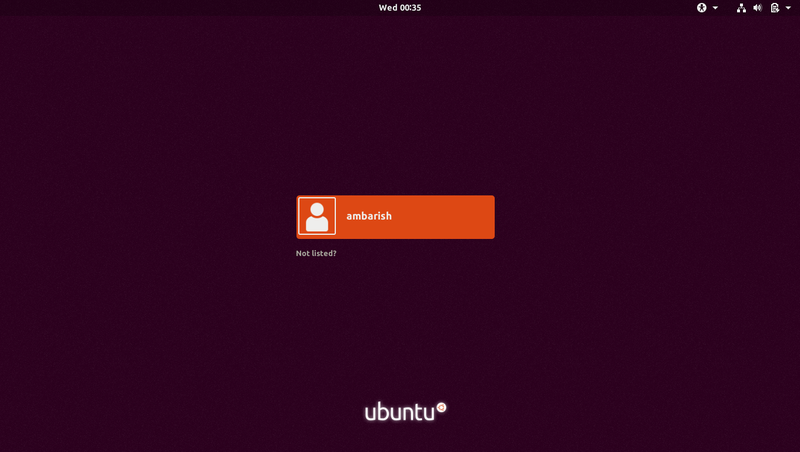 Ubuntu 18.04 LTS has a new Login interface that looks kinda cool. You are all set to login and use! 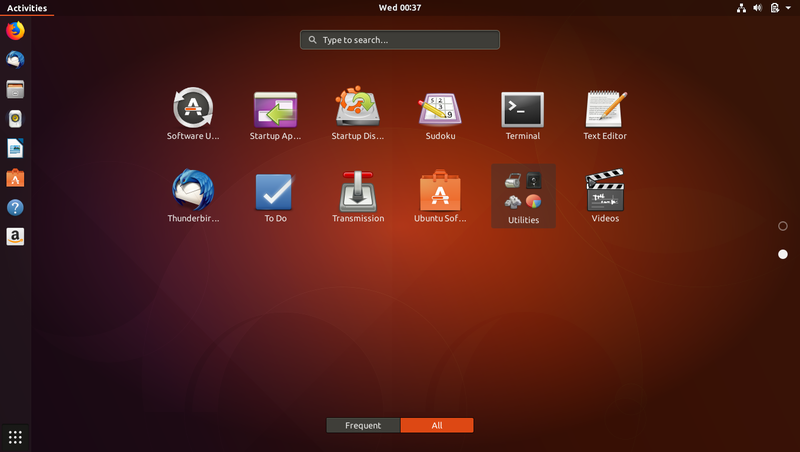 If you are not aware, Canonical has ditched Unity and has switched to GNOME for Ubuntu 18.04. However the launcher is continued and there are different settings for the launcher which can be changed. 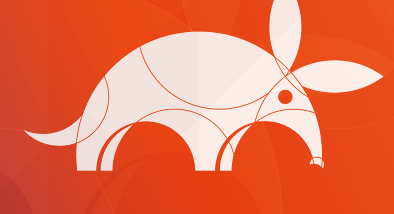 Ubuntu 18.04 is set to release in April and this is a daily build, which is yet not ready for production. However the experience is smooth - though its eating up my RAM. I had always been a Unity fan but GNOME is not disappointing me. Good to see the launcher in it's place and the customization options integrated in the Settings, for changing icon size moving it either top / bottom / right / left. Did you try the daily build? What's your reaction, tell us in the comments.